Mosidi extended her knowledge by volunteering for 2 years as a laboratory assistant in extreme biochemistry at the Department of Microbial, Biochemical and Food Biotechnology of the University of the Free State, where she worked with postgraduate and postdoctoral students on industrially funded projects to gain skills and real-world laboratory experience. In 2017, she completed her degree as the first person in her family to graduate from university. She has expressed her thanks numerous times for her parents’ wonderful support throughout the years. Mosidi contacted Professor Esta van Heerden upon completion of her degree, and began to work part-time on several new industrial projects run by iWater. She now manages a full laboratory, where she does all of the development of specific solutions for various clients. 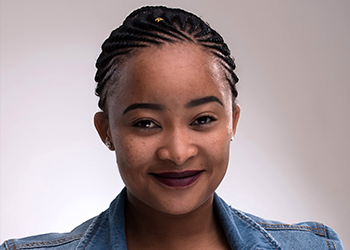 Mosidi is incredibly passionate about and confident in her work. Her favourite saying is: “Enjoy the journey and try to get better every day. And don’t lose the passion and the love for what you do’’.